In this post, I will explain how LASR Servers (both Distributed and Non-distributed) are started from the SAS Visual Analytics Administrator application. We will also look at one particular issue and I will provide you with more details to understand the situation and two strategies to address this issue. When you start a LASR Server from the Visual Analytics Administrator application, the system processes your request in slightly different ways depending on whether you are starting a distributed or non-distributed LASR Server. What happens in the background for a distributed LASR Server? 1. The administrator starts a LASR Server from the Visual Analytics Administrator application. 2. The Visual Analytics Administrator application generates the required code and sends it to the JES to be executed on the SAS Visual Analytics Root Node. 3. The JES invokes the SAS Object Spawner on the Visual Analytics Root Node. 4. The SAS Object Spawner initializes a SAS Workspace Server session. 5. A client connection is established between the JES and the SAS Workspace Server session. The JES sends the distributed LASR Server startup code generated in step 2, and the SAS Workspace Server session executes it. 6. As soon as the distributed LASR Server startup code is executed, a distributed LASR Server instance is created. This instance is independent from the SAS Workspace Server session. After the distributed LASR Server startup code executes, the SAS Workspace Server session, and the client connection drop down. But the LASR Server instance is up and persistent until the administrator stops it. What happens for a non-distributed LASR Server? The JES sends the non-distributed LASR Server startup code generated on step 2, and the SAS Workspace Server session executes it. 6. As soon as the non-distributed LASR Server startup code is executed, a non-distributed LASR Server instance is created. This instance is dependent on the SAS Workspace Server session. After the distributed LASR Server startup code executes, the SAS Workspace Server session, and the client connection become persistent until the administrator stops the non-distributed LASR Server. The SAS Workspace Server session and the client connection are required for the non-distributed LASR Server to be up and persistent. The client connection between the JES and the SAS Workspace Server session in non-distributed deployment is crucial. This connection has to be persistent during the non-distributed LASR Server lifetime. As soon as the JES or SAS Workspace Server session goes down, the client connection is broken and the non-distributed LASR Server will go down as well. And, its data become unavailable. 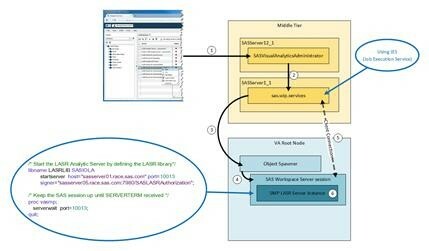 If administrators manage their SAS non-distributed LASR Servers from the SAS Visual Analytics Administrator web application, this will create a dependency between the non-distributed LASR Servers and the middle tier - more specifically with the SASServer1_1 instance (the sas.wip.soapservices application). This dependency does not exist for distributed LASR Servers. When the dependency exists, each time the middle tier or the SASServer1_1 instance is down, all non-distributed LASR Servers that were managed using the SAS Visual Analytics Administrator will go down automatically because the client connection to the non-distributed LASR Server is broken and its associated SAS Workspace Server session will go down. This issue will also appear if the network connection between the Middle Tier and the SAS Visual Analytics Root Node is broken. This will break the client connection and terminate the SAS Workspace Server session(s) and their associated non-distributed LASR Server(s). How can we prevent the issue? Start your non-distributed LASR Servers from a SAS program. Configure your LASR Server to start using the AutoLoad facility. The Object Spawner on the SAS Visual Analytics Root Node. AutoLoad runs as a periodic scheduled task. In the standard configuration, a new run of AutoLoad is started every 15 minutes. AutoLoad periodically scans the contents of a designated host directory, which is referred to as the AutoLoad data directory or drop zone. AutoLoad will automatically start the associated SAS LASR Server, if it is not yet started. 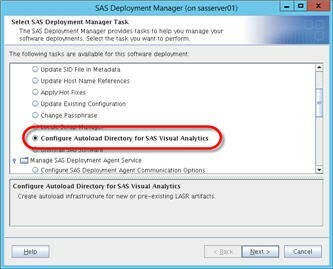 If you do not already have a LASR library configured with AutoLoad, you will need to use the SAS Deployment Manager application to configure an AutoLoad directory. In Administration Tasks, choose Configure an AutoLoad Directory for SAS Visual Analytics. And follow the instructions. VA.AutoLoad.AutoStart: YES to indicate that you want the associated LASR Server to be started if it is not already running. VA.AutoLoad.Enabled: YES to enable the AutoLoad process for the Library. VA.Default.MetadataFolder: to relocate the table(s) metadata registration against a specific metadata folder. VA.Default.Location: to specify the location of the table directory at OS level. VA.Default.Sync. *: to manage the table(s) from the VA.Default.Location. Set the appropriate security against the [SAS-Configuration-Directory]/Levn/Applications/AutoLoad/[Your-LASR-Server-Library-LibRef] to be sure that the appropriate LASR Server administrator will be allowed to manage it. Set the AutoLoad process frequency (default is 15 minutes). “TIME_INTERVAL_MINUTES=[Your-Value]” in the [SAS-Configuration-Directory]/Levn/Applications/AutoLoad/[Your-LASR-Server-Library-LibRef]/schedule. [sh|bat] file. Note: Reference the SAS Visual Analytics Administration Guide for more about the timing of AutoLoad. Schedule the AutoLoad process using the LASR Server administrator account responsible to manage this particular LASR Server by executing the [SAS-Configuration-Directory]/Levn/Applications/AutoLoad/[Your-LASR-Server-Library-LibRef]/schedule. [sh|bat] script. Validate the AutoLoad setup by stopping the SAS LASR Server from SAS Visual Analytics Administrator application, or using SAS code. Wait for the “TIME_INTERVAL_MINUTES=[Your-Value]“, and look at the LASR Server status in SAS Visual Analytics Administrator application, and the AutoLoad logs in [SAS-Configuration-Directory]/Levn/Applications/AutoLoad/[Your-LASR-Server-Library-LibRef]/Logs (one log file each time the AutoLoad process is executed). Whichever technique is used, the non-distributed LASR server will no longer be dependent on the middle-tier. 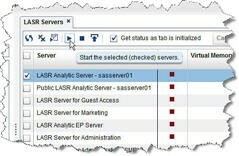 How LASR servers are started from SAS Visual Analytics Administrator was published on SAS Users.